The Canadian ship, HMCS Toronto, a Halifax-class frigate, recently intercepted a major narcotics shipment in the Indian Ocean. 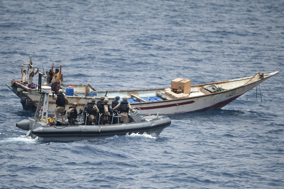 The ship, deployed as a member of Combined Task Force One Five Zero (CTF-150), disrupted the transfer of over a quarter-ton of hashish and 10 kilograms of heroin, as part of the task force’s ongoing operations in the region. CTF-150 was originally established to aid operations in the global war on terrorism, and has since successfully performed anti-drug-trafficking and anti-piracy operations as well. In April, May and June of this year, the HMCS Toronto has been personally responsible for six drug interdictions, resulting in the confiscation of 1.3 tons of heroin and approximately 6 tons of hashish. CTF-150 is currently under the command of a French Navy Commodore. The force is always focused on counter-terrorism operations, specifically routing out maritime drug-trafficking, which has been identified as a major source of finance for many networks of terror. Recently, CTF-150 has also begun to incorporate local maritime security forces into its operations. Vessels from Yemen and Djibouti are being involved in training exercises and patrols, in hopes of bolstering the maritime domain awareness and security of these strategically located countries. As terror networks expand to North Africa, the Red Sea in particular is a vital waterway over which these networks transport illicit cargo. The presence of CTF-150 serves as a clear reminder that the international community will not stand idly by while these trans-national organizations finance their terror with narcotics. The route from the Mediterranean, through the Suez Canal, Red Sea and Gulf of Aden to the Indian Ocean is one of the most heavily traveled shipping routes in the world. As goods and oil flow east and west, thousands of ships and a huge percentage of international trade go through the bodies of water that CTF-150 is assigned to protect. The maritime security of this region is essential to a properly functioning global economy.